Would you sell more of a Barossa Shiraz by putting the price up? 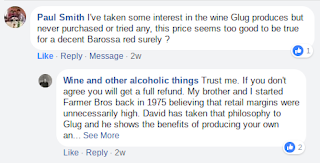 A week or so back I made a return to writing about wine after a break of 30 years or so (I used to pontificate monthly for Gourmet Traveller) when I penned a few words for Facebook on a visit to my winery owning brother David in the Barossa. Delighted to be trying a range of wines at his expense not mine I was particularly taken with my rediscovery of his Goat Square Barossa Shiraz that I enjoyed when it first entered his Glug portfolio some eight years ago. I don't know why it dropped off my radar but I noticed it was selling at a most economical $9.99 a bottle and recommended it as one to restock the cellar with. Maybe I still have a few wine drinking readers for the 2015 Goat Square Shiraz sold out but that is not the reason I am mentioning it again. Rather it's because of an interesting comment from a reader that illustrates something about how most of us buy wine. On the face of it, a tick under 10 bucks a bottle does seem out of kilter with the prices of most small vineyard producers in the Barossa. But it is a price at which an efficient business can make a profit when providing value-for-money is a primary aim. And that is Glug's aim and it will be a sad day if the only way to sell more is to charge more. Just keep on chugging on with the hope that wine lovers will get to understand that price is not the be all and end all guide to quality. "Mataro is seen as a ‘workhorse’ and gave a back palate strength to many early Barossa Shiraz and is still widely used for this purpose. The time has arrived for it to stand alone and many artisans are now working to capture its complexity." It's another $9.99 bargain where you should not let the price put you off.